How to Hike Pico Duarte? When you think about Dominican Republic you will probably think about beach, sand and a good drink resting on a chair-long under the Punta Cana Sun. But the Dominican mountains have a totally different climate and weather compared to Punta Cana beaches. 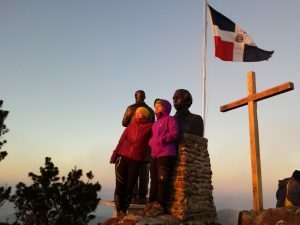 Pico Duarte is the highest peak in the entire Caribbean and it´s an attraction you must do if you are going to spend some days in the Dominican Republic. Especially if you like to do ecotourism activities or you like to be outdoors. For most of the Dominicans that every year make their pilgrimage to see Duarte´s Bust on the summit it´s a complete satisfaction. For most of the foreigners that hike Pico Duarte this is an amazing experience and you are welcome to live it. So, how to hike the highest mountain in the Caribbean? This is a question a lot of people ask to themselves when they decide to make a trip to the paradisiacal Dominican Republic because they have no clue of what to do, how it will be and if it´s safe enough to do it. Located at the center of the Dominican Republic and inside the borders of the Armando Bermudez National Park, Pico Duarte stands at 3,087 meters (10,125 feet) above sea level. A very high landmark if you think that the entire Dominican Republic has only 48,671 square kilometers. The shortest route to the Top is the one called “La Cienaga” which has 23 kilometers (14 miles) from Base Camp to the Summit or 46 kilometers (28 miles) round trip. This is the route that goes by Jarabacoa and Manabao in the dominican province of La Vega. This is the most used route by hikers and adventurers that challenge themselves for the prize of being the highest person in the Dominican Republic and the Caribbean. 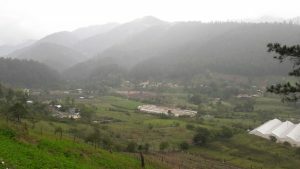 La Cienaga is a small village located inside a big valley. Surrounded by beautiful mountains, La Cienaga is home to all of our guides and mules you will meet on this journey. It´s the perfect place to spend a night to acclimatize before heading towards the highest Dominican mountain. Each of them has its own difficulty level and length. All of our Pico Duarte trips start in La Cienaga, which is about one hour away from Jarabacoa by car. This is by far the most accessible route of all. 1- To know the local life, buy a beer in the colmado and to meet its people and small streets. 2-To acclimatize for the next-day-hike. You will spend the first night in tents surrounded by a beautiful river and by the amazing local flora. We will provide you with comfortable sleeping bags and mattresses so you can spend the night the right way. But if you want to sleep a bit more comfortable we can rent you a nice and warm cabin nearby base camp. Pico Duarte base camp is a safe place and you can park your car there without any issue. There is always a ranger named German who is a very warm and kind human being. Pico Duarte base camp has proper bathrooms and solar panels so you can recharge your electronic devices that night so you can use them during the hike. The place is the last piece of civilization you will have before the first hike to Pico Duarte. To get to Pico Duarte Base Camp we offer transportation in our jeep for 1-3 person groups and safari trucks for 4-15 person groups. We also offer nice and new buses for bigger groups from any city or airport if you don´t have access to a car or if you don´t want to drive in the Dominican highways. Our drivers are always very polite and are willing to satisfy your needs. Do you want to know more about our Pico Duarte itinerary? 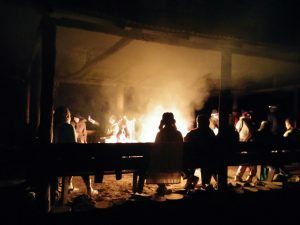 During your stay at base camp you will have a nice and rewarding Sancocho, a Dominican dish made by different kinds of meats, tuber, rice and avocado. This is an amazing way to get ready for the next-day-hike! The next morning you wake up early to get your gear packed so the mules can carry it properly to high camp. 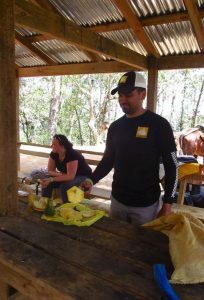 That morning our guides will offer you a tasty dominican coffee, hot chocolate, bread and some bananas. This is a proper light breakfast given the early hour. Remember to take your hiking snacks with you because your next cooked meal will be at 6:00 PM. The reason for this is that we are not allowed to cook in the middle of the trail. Just in the camps. This is an important and crucial National Park Rule to preserve our natural resources and avoid wildfires. You can buy your hiking snacks in Santo Domingo, in Jarabacoa or in a small market at La Cienaga village. The first hike is the most challenging of all and you can easily finish it in something between 8-10 hours. The thing is that you have to hike from Base Camp to La Compartición (HIGH CAMP) and the distance between each camp are 18 kilometers (11 miles of mountain). Of course, there are a lot of stops along the trail and the first one is called “Los Tablones” which comprehends an easy hike of about one hour away. Los Tablones is located at 1270 MASL (4165 feet) and the terrain is mostly flat with some small hills to warm the muscles up. When you arrive to Los Tablones you rest for about 10 minutes, refill your water bottles and go on! There is a lot of water springs along the route and you can refill without any issues. All of the hikers drink from that sources and have never gotten ill but if you feel uncomfortable with this you can buy a filter and carry it with you. Our guides will always be with you and each of them has a walkie-talkie to communicate between them all the time. Good and fluid communication is always an important part of mountaineering! After Los Tablones, the trail starts to tilt until you arrive to the second stop called “La Cotorra”. The stop is one hour away from Los Tablones, but now going upwards. After Los Tablones you need to save energy, hike smart and breathe properly because of the altitude changes you will experience. La Cotorra is at 1720 MASL (5641 feet) and there you will do the same. Rest for 10-15 minutes, eat a bit of your snacks and continue the hike. La Cotorra don´t have any source of water but you will find it at the next one which is called “La Laguna”. La Laguna is at 1980 MASL (6494 feet) and the distance from La Cotorra is 45 minutes roughly. On this stop our guide will give you a tasty pineapple to recharge your batteries and go on with the hike! Now it´s time to keep on going to the next stop called “El Cruce”. El Cruce is at 2100 MASL (6888 feet) and there is a fork that divides the route to Valle del Tetero (LEFT) and Pico Duarte (RIGHT). Obviously you want to be the highest person in the Caribbean so the trail that goes RIGHT is your destination! El Cruce is 30 minutes away from La Laguna and this marks the beginning of one of the most famous or infamous part of the entire trail: “Regret Hill” or “Loma del Arrepentimiento” in Spanish. This part of the trail is very sunny and dry so you better keep your body temperature as low as possible because this is one of the reasons people tend to dehydrate and get tired in this part. Take it easy and climb slow and steady. You will make it! This is a tricky part. Pico Duarte is a mental challenge and your thoughts will determine your success on this mountain. Avoid negative thoughts, try to clear your mind with good music or a good conversation with your partner or guide. This will definitely help you a lot to deal with the endless slopes. 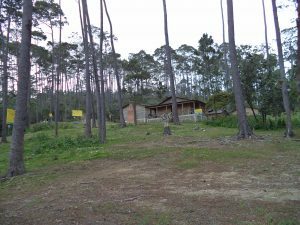 At the middle of the Hill you will have a stop so you can rest for 15 minutes and keep on going to your next and last stop called “Aguita Fria” which is at 2.5 hours away from El Cruce. Aguita Fria is a pretty interesting place. Located at 2600 MASL (8528 feet), there you will start to see the Cao, which is an endemic black bird very alike to the raven. They will be waiting for you so you can give them food but don´t worry they are calm and not dangerous. Aguita Fria gives birth to two of the most important rivers in the Dominican Republic Yaque del Norte and Yaque del Sur so this stop it´s a very important place for the whole Dominican ecosystem. From these sources of water you can refill your water bottles. If you have the opportunity of having bad weather conditions on this stop, you better keep on going because this part can get really really cold! 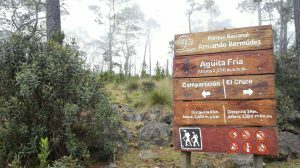 The hiking time from Aguita Fria to La Comparticion High Camps is 2 hours. Finally! The first hike is over! La Comparticion is a nice place. There you have a kitchen, a big wood hut, a campfire area and proper bathrooms. There you will spend one or two nights depending on your trip itinerary. 1- For the 2.5 days / 2 nights itinerary you will spend one night at base camp and a second night at high camp. 2- For the 3.5 days / 3 nights itinerary you will spend one night at base camp and two nights at high camp. Once you get to high camp you pick up the bags that the mules carried and pick a sleeping spot in the big wood hut available for all the hikers. We can also set you one of our tents if you want more privacy. Our cook will be preparing a nice dinner based on rice, salads, chicken and soup. This will fill your energy levels and help you adapt better to the altitude of High Camp (2450 MASL / 8036 feet). Meanwhile you can go to the water springs and get a nice and rewarding bath that is great for your sore muscles. If you decide to do our 2.5-day-itinerary you better go to sleep after dinner because you will need to wake up at 3:30 AM so you can be on Top of the Caribbean just before sunrise. Do you want to watch the highest sunrise in the Caribbean? 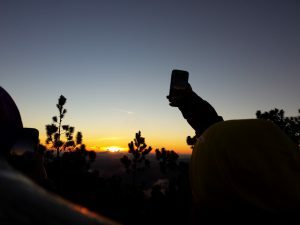 Watching the sunrise on top of Pico Duarte is a beautiful and rewarding spectacle you must experience. At this hour the summit is cold and windy so you must have your layers ready so you and your guide don´t get frozen because of the low temperatures. Temperatures on Pico Duarte can be very cold at night and early in the morning and sometimes can be below the freezing point. After watching the sunrise you hike down back to High Camp where a proper breakfast will be waiting for you made by our kind and warm cook named Roselio. After eating your breakfast, you finish to pack your gear and start the hike back to BASE CAMP. If you choose the 3.5-day-itinerary you will spend a second night in High Camp and hike down the next day. The hike from High Camp to Base Camp takes about 6-8 hours to complete depending on your pace. Once at Base Camp, our cook will provide you a nice Dominican lunch before our driver takes you to Jarabacoa. Pico Duarte is an amazing experience. 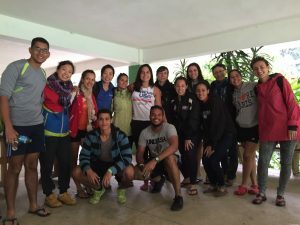 Our guides from Santo Domingo and our local guides will definitely make the difference on this trip. 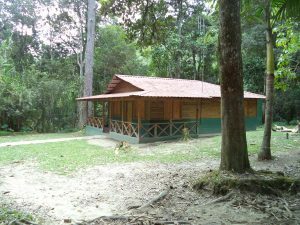 Some hikers tend to hire local guides once they get to La Cienaga, but having a previous reservation (No down payment needed) is the best choice. Our guides know how to deal with a lot of situations and they definitely know how and when to give you the right information on every stage of the trail. They are also trained in First Aid by the International Red Cross and have a lot of mountain experience dealing with big and small groups. Pico Duarte is not an easy game. A very important thing we require is that you start to read little by little about the route, conditions and so on. 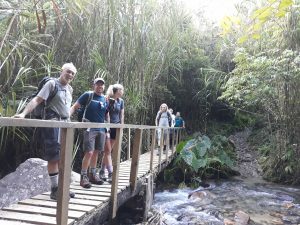 For most of the hikers that go to Pico Duarte, the first impression they received it´s a bit shocking because they believed it was a bit easier. A good previous training is the best tool to deal with this mountain. 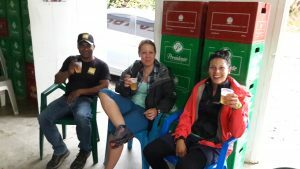 Pico Duarte is also a mountain with no luxury at all but we will do our best to make your experience a good and satisfactory one providing good advice, kind guides, mules and specially a lot of food. If you are expecting a luxury-all-inclusive trip, maybe this is not the trip you are looking for. The magnitude of this mountain range, the beautiful nature and the things you will enjoy and learn, will make about this experience a good and an unforgettable one!